In cooperation with the Division for Conservation of Heritage Sites, Department of Culture, Ministry of Home and Cultural Affairs of Bhutan, we surveyed traditional houses built with the rammed earth construction technique in the capital, Thimphu, and the Paro Dzongkhag from July 16th to July 24th, 2018. 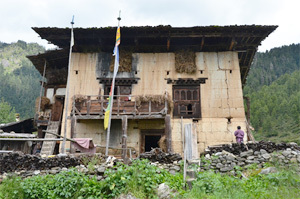 We focused on an old house located in Kabesa Village in the northern outskirts of Thimphu as the best example of a house built in an ancient style among the old farm houses we discovered through the surveys. 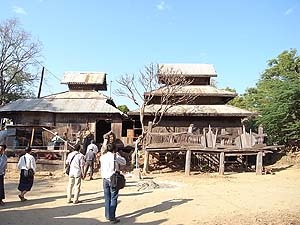 Regrettably, the upper floors and other wooden elements of the house, which had been left uninhabited for many years, collapsed last year, but its external walls built with rammed earth remain. As a result of emphasizing the significance of preserving this house at a workshop held in the city in March 2018, the owner withdrew his intention to demolish the house, and a movement began toward its restoration. In response to this, we collected the wooden members of the house, and individually recorded and identified their original locations, before placing them into temporary storage. We confirmed that the members were far less damaged or missing than expected, which enables an accurate restoration. We expect that examination of concrete restoration and utilization measures will progress after this. Since 2016, the research and study of old houses in Bhutan has been conducted under Grants-in-Aid for Scientific Research. During our stay in Bhutan this time, we received the sad news that the representative of the research project, Dr. Nobuo KAMEI, Director General of Tokyo National Research Institute for Cultural Properties, had passed away. The Bhutanese people involved in the cooperation project proposed that we should hold a memorial service for the DG at Changangkha Lhakhang, a venerable temple overlooking the city of Thimphu. 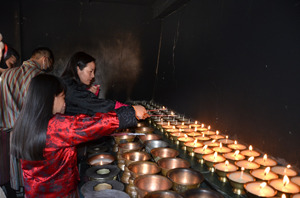 The staff members involved in the joint activities gathered there to pray for the repose of his soul by lighting 108 votive candles. As part of the above-mentioned project commissioned by the Agency for Cultural Affairs, we have continually provided technical assistance to Nepal. Already, in 2018, we have dispatched on-site research missions in February, March, April, and May. 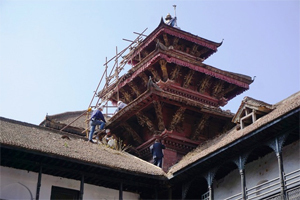 For the rehabilitation of the Aganchen Temple and its associated buildings in the Hanumandhoka Palace in Kathmandu, we surveyed detailed specifications and traces of transformation of the brick masonry surfaces of the inner walls whose finishing layers had peeled off. The brick masonry, all of which looks the same, differs in material, dimension, or construction method according to age. Evidence remains at places where the wall or opening was altered. Observation following the cleaning inside cracks blocked by the rubble that had collapsed from the upper section, revealed numerous clues to retrace the history of various extensions and alterations since its construction in the 17th century. The number of targets to be clarified through further research has increased, including the existence of an unknown mural painting unveiled during this process. We have further increased our awareness of this building’s great value as physical evidence to comprehend history, in addition to the highly elaborate work applied to the subsequently altered sections as a particularly important building in the palace. As preparations for the rehabilitation work are being made under the direction of experts dispatched from Japan International Cooperation Agency (JICA), we are cooperating in the examination of concrete conservation methods and consultation with the relevant institutions in Nepal. Although the work has not yet begun due to various difficulties in procedures, as a united team we would like to make every effort to conserve the building’s value as a cultural heritage. 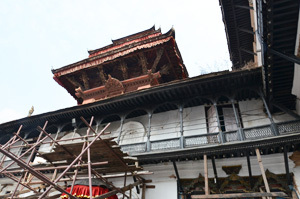 Meanwhile, we have continued to cooperate in the conservation of historic settlements in the Kathmandu Valley. 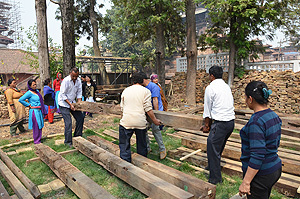 In May 2018, we organized a workshop at the historic settlement of Sankhu, inscribed in the Tentative List of World Heritage Sites of Nepal, but seriously damaged by the earthquake, for those officers in charge of public administration in each city holding jurisdiction over historic areas and settlements. Under the theme of conservation of historic water channel networks, participants from six cities discussed their current situations and issues together with urban design experts, and developed six suggestions. The outcomes will be shared with those concerned in other cities who could not attend the workshop this time. We expect the suggestions will help to conserve each historic settlement. 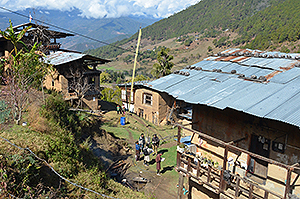 The traditional houses in the western region of Bhutan are built with earth rammed down into a formwork, a method called rammed earth construction. These houses have become a key element of the beautiful cultural landscape of the country with lush greenery. However, unlike religious and administrative buildings such as temples and castles, they are not protected legally as cultural heritage, and precious old houses are being lost rapidly due to natural disasters, modernization, and various other factors. 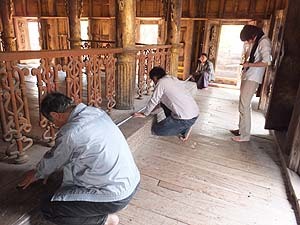 Since 2012, Tokyo National Research Institute for Cultural Properties has been conducting architectural studies and research on buildings constructed in the rammed earth method jointly with the Division for Conservation of Heritage Sites, Department of Culture, Ministry of Home and Cultural Affairs in Bhutan. During the process, both sides became once again strongly aware of the value of old houses as cultural heritage and the urgency in their conservation. Therefore, on March 13th, 2018, we organized a workshop joined by Japanese and Bhutanese experts, persons in charge from the Ministry of Works and Human Settlement and local governments, and owners of traditional houses at the headquarters of the Department of Culture in Thimphu. 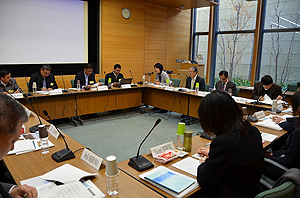 We shared information about the survey outcomes including the chronology and the changing process of traditional house architecture, the legal framework for protection of cultural heritage in Bhutan, and how Japanese traditional houses are protected. We also exchanged opinions on specific traditional houses to be preserved and related future issues. We hear that soon after the workshop, a positive effect began to appear through a movement toward the preservation and utilization of important houses. We expect its great contribution to the consolidation of the legal system for cultural heritage, which has been stagnant in the country. 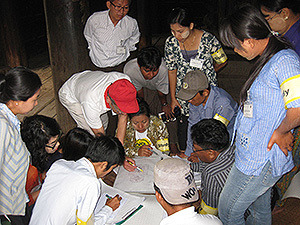 For more than 15 years the Tokyo National Research Institute for Cultural Properties (TNRICP) has been collaborating with the Cambodian national authority for the protection and management of Angkor and the region of Siem Reap (APSARA) in various ways, including conducting joint research and personneltraining. 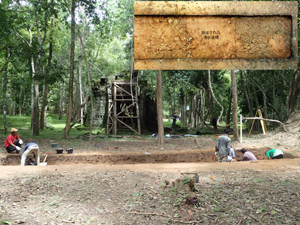 Over this period of time, fieldworks have been conducted mostly at the Ta Nei Temple ruin of the Angkor onuments. 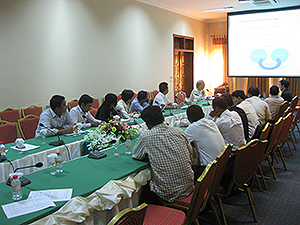 The most recent workshop was held in Cambodia from January 26th to 28th, 2017 to support the creation of conservation, management and enhancement plan for the site. Joining the workshop were H. E. Mr. Ros Borath, Deputy Director General of APSARA, and other experts from the organization’s sections on the conservation of monuments, tourism, forestry and hydrology. A total of more than 20 staff members attended. On the first day, lectures were given at the APSARA head office addressing basic outlining and planning procedures for the conservation and management of archaeological sites. The second day was a site visit to Ta Nei and its vicinity to survey and confirm the current state of the area. On the third day, the participants returned indoors to discuss the basic direction for moving forward with planning and how to carry out the conservation and enhancement project after this. 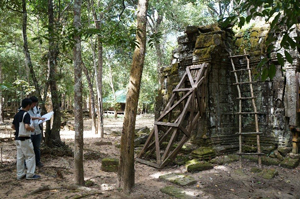 Ta Nei Temple is a major archaeological ruin within the core zone of the Angkor World Heritage Site that is constantly filled with tourists, but it still retains the striking atmosphere of a lost temple overgrown by jungle forest. 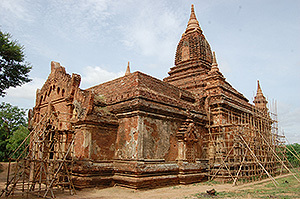 A major outcome of the workshop discussions was the agreement on significant issues such as the determination to upkeep the temple, maintaining its present state so that people can safely tour the ruin, and to restore the original access route to the temple so that visitors can get a physical sense of the site’s relationship to nearby Angkor sites. There was also agreement that all the concerned sections would work together on steadily pursuing specific areas of endeavor, including archaeological excavations and other necessary surveys. This project is being positioned as a pilot model project for the maintenance of ruins conducted by Cambodian initiative, and TNRICP will continue to provide the necessary technical assistance to enable the work to be carried out properly and smoothly. 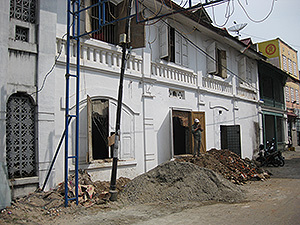 The National Research Institute for Cultural Properties, Tokyo, has been continuously supporting the revitalization of the historical district of Padang by conducting academic research activities and holding local workshops in such fields as urban planning, architecture and sociology, since the institute conducted damage-status surveys just after the September 2009 Sumatra earthquake at the request of UNESCO and the Indonesian government. 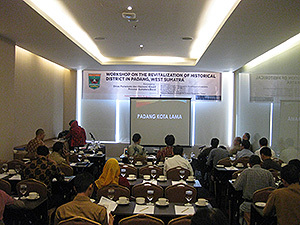 In 2015, a workshop on the revitalization of the historical district in Padang, West Sumatra was held on August 26, organized by the Department of Tourism and Creative Economy of West Sumatra Province and coorganized by the NRICPT, the Ministry of Culture and Education, Indonesia, the Padang City Government, Bung Hatta Universities, and others. For the workshop, in addition to experts from Indonesia and Japan, we invited a local architect who has been promoting the conservation of a historic district in George Town, Penang, Malaysia, and a movement for the inscription of the district on the World Heritage List, as well as a representative from relevant nongovernmental organization. The main theme of the workshop was about ways of promoting local development by making use of cultural heritages through citizens’ participation. In the workshop held at a hotel in Padang, more than 50 people including not only representatives from relevant authorities at national, provincial and municipal levels but also representatives from residents living in the historical district attended the workshop, a strong turnout exceeding the capacity of the venue. In the question-and-answer session, participants showed especially high interest in institutional frameworks, participation by local communities, and ways of cooperation with public administrations and universities. In cooperation with the relevant authorities in charge of the revitalization of the historic district, the Padang City Government is currently making preparations for the establishment of a group tasked with discussing local development of the district. We will continue to watch for such activities led by local people and provide necessary support. 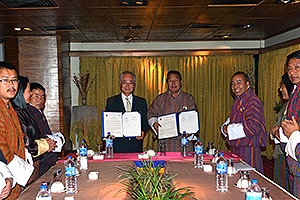 This year will be the third year since the “Networking Core Centers for International Cooperation in the Conservation of Cultural Heritage Project, Preservation of Traditional Buildings in the Kingdom of Bhutan,” which was commissioned by the Agency for Cultural Affairs, started in partnership with the Bhutanese Ministry of Home and Cultural Affairs. 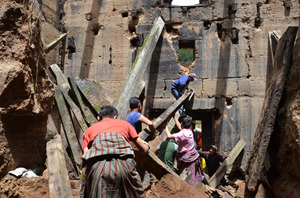 Bhutan has many rammed earthen buildings such as residences, and this project aims to preserve those buildings and improve their safety. 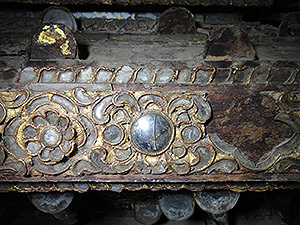 The Institute has been conducting surveys and studies of traditional Bhutanese construction techniques from the perspectives of architectural history and structural mechanics. The surveys and studies include surveys to examine traditional methods of construction and analyses of the structural strength and earthquake resistance of those buildings. 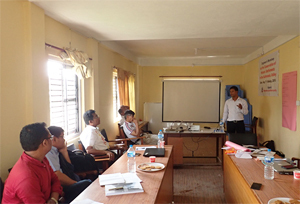 From September 18 to 27, 2014, a fifth field survey was conducted in cooperation with the Institute’s Bhutanese counterpart, the Division for Conservation of Heritage Sites (DCHS) of the Department of Culture under the Ministry of Home and Cultural Affairs. Prior to this survey, the DCHS had been asked to prepare several test pieces of rammed earth in accordance with instructions regarding the ratios of materials in those pieces. Cores were taken from the prepared test pieces to examine their strength. Results of the inspection verified that walls made of lime and rammed earth provided structural reinforcement. In the past, the strength of these walls depended entirely on the craftsman’s gauging of the size of soil particles and the optimum moisture content of soil. For the inspection, however, DCHS staff members received guidance in operational procedures from the Institute so that these aspects could be quantified by laboratory testing. In addition, the Institute’s structural study team measured microtremors to simulate behavioral characteristics of a temple near Thimphu. 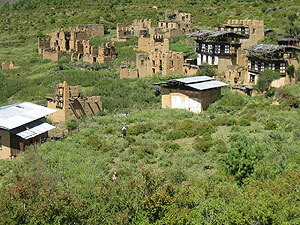 The architectural study team surveyed several residences and ruins that preserve the old style of architecture in a rural community within Paro Dzongkag. This survey aimed to ascertain changes in structural forms and determine their relationship to wall construction techniques. Interviews were also conducted with craftsmen and technicians who are experienced in rammed earth construction in order to gain knowledge. Possible ways to improve methods of construction were discussed with these craftsmen and technicians. Bhutan experienced heavy rains during the survey. A building that was surveyed last year was found to have already collapsed and new damage to a building that was visited just a few days prior was noted. These examples reveal how fragile these buildings are if they are not properly maintained and these examples highlighted the need to preserve these traditional buildings. A project to preserve the Thang Long Imperial Citadel site, a World Cultural Heritage located in the heart of Vietnam’s capital city, has been undertaken by the NRICPT, commissioned by the UNESCO Office in Hanoi to spearhead Japanese efforts, since 2010. The project is scheduled to conclude at the end of this year. The following efforts were undertaken at the site since the latter half of last year. 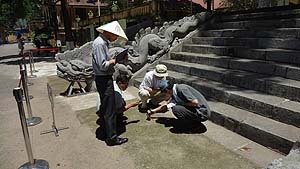 Selected staff of the Thang Long – Hanoi Heritage Conservation Centre received training from both Japanese and Vietnamese experts to establish a geographic information system (GIS) to manage cultural properties. Attendees learned various topics including basic concepts of using a GIS to manage cultural properties, correcting the base map using measurement points on-site, and ways to create a data base. This training has allowed staff to conduct basic operations themselves. 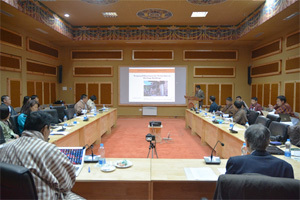 A workshop was co-organized by the NRICPT and the TL Centre in cooperation with the Institute of Archaeology, Imperial City Research Center, and the Nara National Research Institute for Cultural Properties. 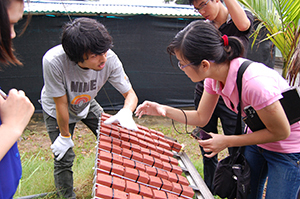 The workshop focused on the study of ancient roofing techniques by comparing roof tiles unearthed from the site with those found in Japan. Experts from both countries exchanged their knowledge and opinions, and they also visited excavations at the ancient temple and traces of ceramic kilns. 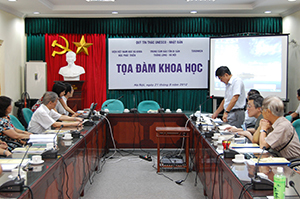 A workshop on socio-economical assessment of the value of the Thang Long site was co-organized by the NRICPT with the TL Centre and Institute of Vietnamese Studies and Development Sciences, Hanoi National University (IVIDES). Experts from both countries gave presentations based on survey results and interviews with relevant individuals. The experts actively discussed their views on the future use of the site. 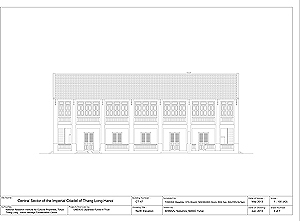 Historical military buildings that were built during French colonial rule at the Thang Long site were surveyed with the TL Centre staff. Together, a new survey and supplementary surveys surveyed 7 buildings in order to prepare accurate documentation of the current status of these buildings, which have value as cultural properties, as basic data for management of cultural properties. Plans are to publish survey drawings, including those of 10 previously surveyed buildings, and to offer the digital data to the TL Centre. At the excavation site, monitoring data were collected from sensors that have measured moisture migration in the soil where archaeological remains are located. Preserved bricks that had been subjected to an outdoor exposure test were also recovered for analysis of the test results. In addition, local staff members were given lectures on the use of equipment and materials and methods of data analysis to enable them to make similar measurements even though the current project has concluded. A symposium was held to bring together experts in charge of different portions of the project and other relevant personnel. The symposium served as a forum to summarize achievements of the project thus far and to exchange opinions on issues with an eye towards the future. 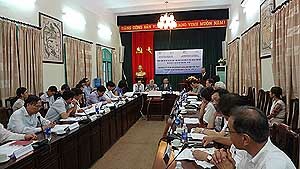 Nine presentations were made in this two-day symposium with more than 60 participants from both countries and the UNESCO Office in Hanoi. 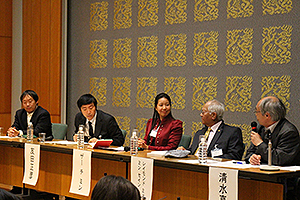 The symposium, which was also one of the events to commemorate 2013 as the Japan-Vietnam Friendship Year, allowed participants to reaffirm the significance of the site in different terms and to sense the extensive achievements of the project firsthand, including studies on appropriate conservation efforts, planning site management, and teaching and training personnel to create a system to preserve and manage the Thang Long site. Japanese personnel are currently working, together with their Vietnamese counterparts, to publish a final project report by the end of the year. A project to preserve the Thang Long Imperial Citadel site, a World Cultural Heritage located in the heart of Vietnam’s capital city, has been undertaken since 2010 with the close cooperation of Japanese and Vietnamese experts. The NRICPT has been commissioned by the UNESCO Office in Hanoi as the base for Japanese efforts　During the first half of this year, the following efforts were undertaken. From August 7 to 9, a field study was conducted at the excavation site next to the site where the new Parliament House is being constructed. Sensors to measure moisture migration in the soil where archaeological remains are located were replaced and added. 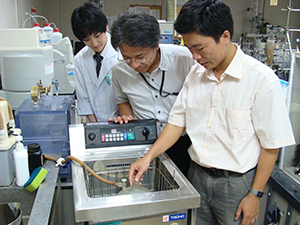 An additional test area was established to measure inhibition of surface evaporation by a sand layer covering. 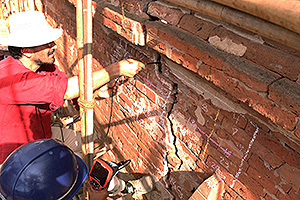 An outdoor exposure test was also begun to examine the effectiveness of conservation techniques using brick specimens with physical characteristics similar to ancient bricks unearthed from the site. Automated monitoring of local meteorological conditions will continue. 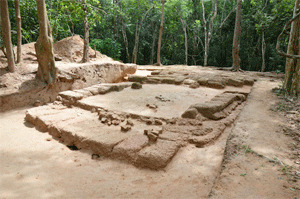 Analysis of the data obtained will lead to proposals for appropriate conservation approaches. On August 21, a workshop was co-organized with the Thang Long—Hanoi Heritage Conservation Center (TL Centre) and the Institute of Vietnamese Studies and Development Sciences, Hanoi National University (IVIDES). 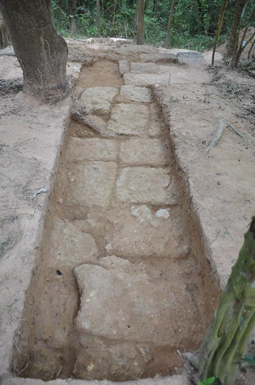 The on-site workshop covered the layout of the central area of the Thang Long Imperial Citadel and its comparison to other ancient capitals in East Asia. The workshop featured presentations by Japanese and Vietnamese experts based on their studies of historical records and results of recent excavations as well as a discussion. The layout and history of the Thang Long Citadel, much of which are still unclear, was actively discussed. In addition, “Selected Japanese and Vietnamese Papers on the Thang Long Citadel” was published in conjunction with the workshop. 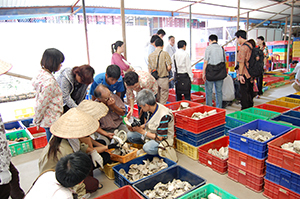 From September 10 to 12, the 1st workshop on archaeological artifacts excavated at the Thang Long site was held in Hanoi. The workshop was co-organized with the TL Centre and enjoyed the cooperation of the Institute of Archaeology, the Imperial City Research Center, and the Nara National Research Institute for Cultural Properties (NNRICP). Participating Japanese and Vietnamese experts shared their knowledge and exchanged opinions on ceramics and roof tiles with regard to classification of their styles, techniques used to produce them, and sites where they were produced. These discussions took place while experts directly viewing unearthed objects. The participants were again reminded of the importance of such a joint study. 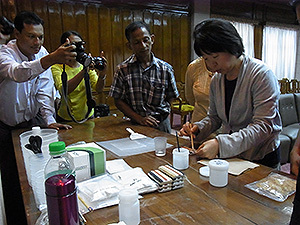 From September 10 to 28, an expert on wood material from Vietnam Forestry University was invited to the NNRICP to carry out joint experiments on techniques to conserve excavated wooden objects. Different laboratory experiments were conducted, including identification of tree species and examination of the effectiveness of resin impregnation, using test pieces unearthed from the Thang Long site along with fresh specimens from Vietnam.